Dermot O'Leary hosted the 23rd National Television Awards on 23 January 2018 at The O2 Arena in London. Over 14 million people viewed the first episode and it struck a chord with many divers and ocean lovers. Blue Planet II took four years to make and the team behind it went on 125 expeditions, to 39 countries. They spent over 6,000 hours underwater, filming on every continent and across every ocean. The team made breakthroughs and filmed giant trevally leaping out of the sea to catch flying terns and spotted a grouper standing on its head to tell an octopus where other, snackable, fish were hiding. Each episode provoked a flurry of Tweets. This is typical. "Shed some silent tears watching Blue Planet 2 - the last episode. Must reduce plastic waste!" And Blue Planet II viewers vowed never to use plastic again after watching the heartbreaking moment a whale carried her dead newborn baby around the ocean. Blue Planet II was even mentioned by the UK Chancellor Philip Hammond in his 2017 Budget speech. "Audiences across the country, glued to Blue Planet II, have been starkly reminded of the problems of plastics pollution. The UK led the world on climate change agreements, and is a pioneer in protecting marine environments. Now I want us to become a world leader in tackling the scourge of plastic littering our planet and our oceans." The series narrator - Sir David Attenborough - collected the 'National Television Impact Award' on behalf of the BBC Natural History Unit. 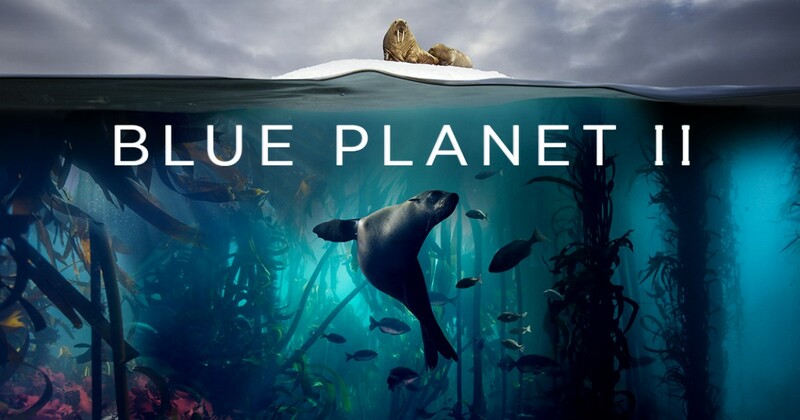 It is worth noting that the ratings for Blue Planet II are the highest ever recorded for a nature show and it was the UK’s most watched TV show of 2017.